There are a few things to consider before purchasing one. Think of this as a latex paint sprayer buying guide. What type of paint sprayer will you be buying? There are 2 main types of paint sprayers, HVLP and airless paint sprayers. First, the HVLP paint sprayer is usually slower. They are best for small projects like cabinets or doors. These paint sprayers are typically used for more detailed, finer finishes with little overspray. Second, the airless paint sprayers are best for large projects like houses. They are generally more powerful and pump out much more paint. There’s a huge difference between wanting to paint the entire exterior of your house and wanting to paint a simple door. If you’re only looking to do small projects, you don’t want to waste money on more powerful paint sprayers. More power means more expensive. For example, take into consideration the PSI (pounds per square inch). Anything higher than 3000 is generally used for heavy-duty projects (not intended for the do-it-yourself homeowner). Typically, these are for industrial uses. Between 2000 and 3000 PSI, you will want to use these for houses, pools, and other fairly large projects. Finally, you will want to paint gates, doors, and other small jobs for paint sprayers below 2000 PSI. This is not written the law, but it’s a good rule to follow. You do not want to waste money on paint sprayers with high PSI when you don’t need the power. How quickly do you want to get the job done? Also, take into consideration how quickly you want to get the job done. Higher GPM (gallons per minute) means faster painting. A 3 GPM paint sprayer will be pumping out paint twice as fast as a 1.5 GPM paint sprayer. However, at the same time, a higher GPM paint sprayer is harder to maintain. That’s why it’s important to take into consideration how fast you want to get the job done and how well you think you can handle the paint sprayer. If you aren’t confident that you can handle a high GPM paint sprayer, please don’t get one. Get a lower GPM so that you can maintain your paint job better. Finally, take note of any negative aspects of the paint sprayers. Some paint sprayers cannot paint vertically (like the ceiling). Others might be a hassle to clean up. There are certain miscellaneous aspects that might suit you but not suit others. With that said, you are now equipped with a basic understanding of choosing the right paint sprayer. In each review, you will see a more detailed breakdown to give you an even better idea of whether or not you are choosing the correct paint sprayer. But…What’s the Overall Best Paint Sprayer for Staining Your Deck? The Critter Spray Gun is the best paint sprayer for staining your deck! Whether you are a homeowner learning how to paint your deck with a sprayer or a handyman searching for the best sprayer for painting your deck, you will find the Critter Spray Products 22032 118SG Siphon Gun to be suitable for your needs. It is an excellent paint sprayer. And yet you’ll find that it is one of the cheapest you’ll find online to paint your deck with. In addition, the Critter Spray Products 22032 118SG Siphon Gun provides a flexible solution for any other type of home painting project. With it, you can paint your fence 10x faster than using a roller or paintbrush. And if you want to put a fine finish on your furniture, you can save more time and effort because of the less strain during painting. The Critter Spray Products 22032 118SG Siphon Gun comes fully packed with a superior mason jar. That will surely help you handle a wide variety of projects. For these reasons, we recommend it as the best fence sprayer for you! This spray gun is perfect for DIY tasks and homeowners who have a passion for woodwork and spray painting. Wagner 518080 includes 2 air filters to protect the finished product from dust, a one-quart high-quality cup, and a 1.5 quarts cup. This spray gun is very lightweight and powerful. You can set up the product within a few minutes. 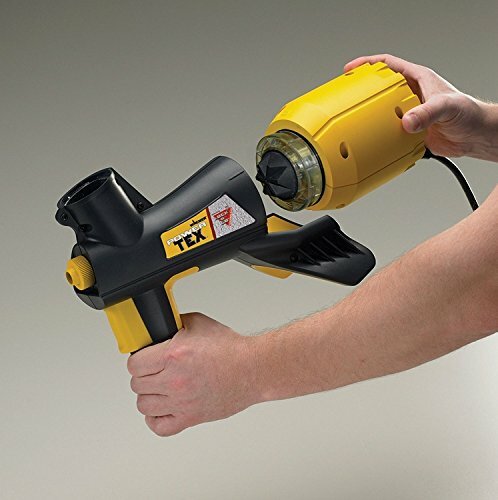 This gun features a viscosity cup for measuring the density of material you are using, and you can adjust the spray pattern if you need. With the Wagner 518080, you can use numerous kinds of paints, stains, lacquers, and primers. Many people like the included large 2 filters, which prevents dust from falling into the finish. Therefore, you are ensured with an even and smooth outcome. The Wagner 518080 features 3 spray patterns and a 20-foot long air hose. You can set the pressure into different settings and a metal spray gun with a 2-stage turbine for spraying interior latex paint. It lessens the over spraying of thin materials like stains and lacquers. The variable flow control lets you change from working large surface to detailed ones like window panes and painting trim. HVLP sprayers work differently than the airless sprayers because they discharge low volume of paint that produces a much finer spray pattern or mist. Many people use them for painting louvered or paneled doors, trim, shutters, and other surfaces that need small paint and control. Airless sprayers discharge high paint volumes and are perfect for painting large surfaces. It does not mean that Wagner 518080 cannot be applied to painting large walls. The process will be slower because this is a compact model. Many professional woodworkers consider the Wagner 518080 a mid-range product because of its inability to produce very smooth results using all paints. On the other hand, for the DIY people and contractor that do not mind a mild orange peel finish using some latex paints, then this unit is perfect and highly recommended. Check Amazon for More Info! Wagner Spray Tech 520000 Power Tex Texture SprayerWagner Spray Tech 520000 features an all-in-one texture sprayer. With this model, you do not need a separate air compressor or hoses. It features a built-in turbine having enough power to texturize the whole ceiling. It is designed perfectly and it is best for small projects. The company included a Lock-n-Go feature that allows you to setup and clean the equipment with no tools needed. So, what is included in the box? As mentioned earlier, this model features an inbuilt air turbine that produces sufficient air to produce professional looking finishes. Because of this design, you do not need a separate air compressor or air hoses. The turbine is operated at 120 volts. This product received numerous awards from consumer electronic reviews. Wagner Spray Tech 520000 features a big one gallon, 2-position hopper that you can easily setup for when working with walls or ceilings without having the need for adapters. You just have to fill the hopper with the same materials that pro use, connect the hopper to a conventional 15 amperes wall socket, then spray. To stabilize the product, it includes a tripod stand. The built-in armrest keeps you comfortable while working. If the setup and cleanup is an issue to use, then the Lock-n-Go feature allows you to set up and clean up the product anywhere. You do not have to bring any tools with you. The assembly process only takes a few minutes. You just have to lock the air turbine at the back of the gun with just one twist and place the hopper on the top of the gun. Screw the desired nozzle and the spray gun is ready to rock! Cleaning this model is very easy. Just remove the air turbine, nozzle, and hopper from the spray gun, and then clean them with the included brush with a warm and soapy water. Dry the unit and reassemble it for easy storage. This spray includes 3 types of nozzles – small, medium, and large and variable flow trigger for generating professional outputs, which are the Orange Peel, Knockdown, and Acoustical Popcorn. This sprayer is designed for working with various water-based textures materials like standard, aggregated, unaggregated, and diluted joint compound. You also have a one-year limited warranty when you buy this spray gun. Critter Spray Products 22032 118SG Siphon GunIf you are a woodworker who is serious about your works and want to achieve professional results, then this spray gun might be your best buddy. This spray gun is very easy to use and clean. It only features two adjustments which are the liquid nozzle height and regulated air supply. You just have to connect a jar with thinners with this, and then you are ready to spray. This spray gun is perfect for small to medium projects that only use a brush or spray can. When spraying various materials, there is no need for additional nozzles. Instructions are included on how to use this equipment. This gun sprays perfectly on patio furniture, woodwork, and etc. This product is loved by many woodworkers, but it does not mean that it doesn’t have some drawbacks. This model has one flaw in its design. The Critter Company painted the whole frame of the spray gun. This is very wrong because the paint will not stick to base metal alloys. This will make the paint flakes off and scatter everywhere. The adhesion mechanism of the paint is very substandard that you can actually scratch it by using your fingernails. It can contaminate the paint no matter how cautious you are. If you are painting white enamel, you might get a little bluish effect because of this flaw in the design. When you try to wipe the gun with a solvent, its paint will fade. Therefore, paint guns should have no colors. It should be plain metal without paint. There is also one additional drawback of this model. 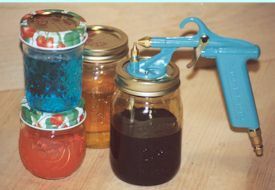 When the jar is hooked up, the gun has the tendency to tip over. This is likely going to happen when the jar is almost empty or empty. The gun should have been balanced. The gun features a hook that you can use to hang it when you are not using it. If you intend to spray solvent-based results, ensure that you get the Mason jars along with the cork. The rubber seals can be dissolved. This will give you a great mess and dirt finish. The Wagner 0515022T Reconditioned Pro Coat Airless Paint Sprayer seems to be the popular choice among homeowners or business owners who want their paint job to appear like professionals did it. With the positive reviews and user feedback, it shouldn’t come as a surprise that the Wagner 0515022T ranks as one of the top-selling paint sprayers on the market today. The Wagner 0515022T has a very dependable ½ HP motor that can be plugged into your regular household current. It can deliver an adjustable pressure of up to 2800 PSI. At this rate, this paint sprayer from Wagner doesn’t only work effectively on houses, barns, trailers, boats, and cabins; it can even work on multi-story houses. This paint sprayer from Wagner is also compact and portable with its 17 inches x 14 inches x 11 inches measurement and 23 lbs. weight. Its extra long 35-foot hose can extend its reach even to out of the way areas. The Wagner 0515022 features a 0.24 GPM paint flow rate which allows users to spray as much as 1 gallon of paint in just 5 minutes. You can also draw paint, sealers or stain directly from a 5-gallon pail. When you use the adjustable pressure controls, you can overspray. With this paint sprayer, you can spray with both the speed & efficiency of a professional painter. When it comes to cleanups, the Wagner 0515022T Reconditioned Pro Coat Airless Paint Sprayer is easy to clean. You can simply connect it your garden hose using the garden hose adaptor included in the package to the inlet and you can do a quick flush clean up of the entire system. It will only consume less than 10 mins. of your time. 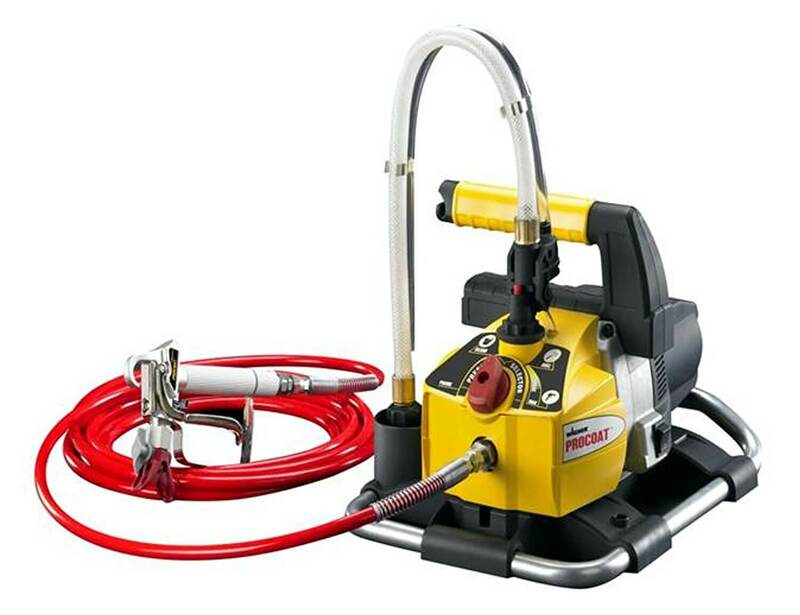 This paint sprayer also comes with a high-end piston pump w/ spray gun. Since it has a 0.515 reversible spray tip, you can use it for a wide range of spray jobs. You may also use it for quick clog clearing. The Wagner 0515022T features a powerful ½ HP motor users can plug to a regular household current. This paint sprayer can deliver an adjustable pressure of up to 2800 PSI – allowing it to work effectively on houses, barns, trailers, boats, cabins and even on multi-story houses. It is compact and portable with its 17 inches x 14 inches x 11 inches measurement and 23 lbs. weight. It features an extra long 35-foot hose which allows users to reach even out of the way areas. The Wagner 0515022T Reconditioned Pro Coat Airless Paint Sprayer has a 0.24 GPM paint flow rate – allowing users to spray 1 gallon to 5 gallons of paint in a matter of minutes. 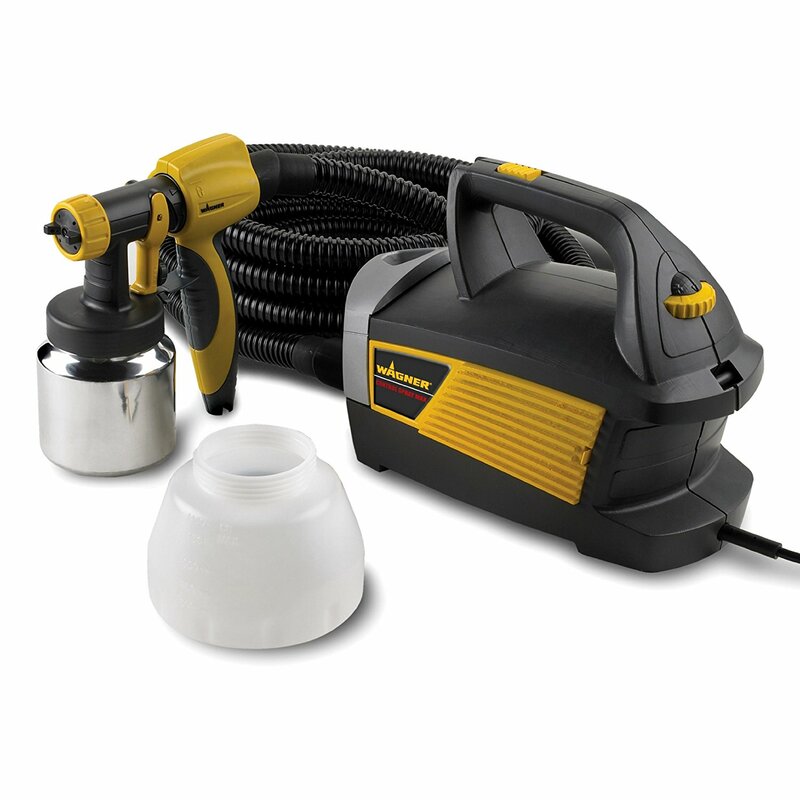 You can also draw paint, sealers or stain and use the adjustable pressure controls to overspray. This airless paint sprayer is easy to clean thanks to the garden hose adapter that comes with the package. It can help users do a quick flush clean up of the entire system. This Wagner airless paint sprayer features a high-end piston pump w/ spray gun and a 0.515 reversible spray tip – letting you use it for a wide array of spray jobs and even quick clog clearing. Browsing through all the customer reviews for the Wagner 0515022T, this airless paint sprayer has great reviews and feedbacks from buyers and users for a really good reason – it delivers. Some of the posted comments include being an excellent airless sprayer for the buck and being a great deal. There are also those who note that it surely exceeds expectations. Users mention that the Wagner 0515022T Reconditioned Pro Coat Airless Paint Sprayer runs very smoothly. It also features ample pressure to spray the best paints straight from the can w/o thinning. Users also love the excellent spray gun, adjustable pressure, long hose and the easy cleaning up process. There are also users who speak highly of the anti-clog inlet button. One user also mentioned that he used this paint sprayer for painting his two-story house. He notes that it performed really well throughout the entire painting process. Overall, the Wagner 0515022T paint sprayer definitely delivers as advertised and even exceeds expectations. It continues to receive very high star ratings because of its great performance. Since it is one of the most sought-after airless paint sprayers on the market, you can expect that stocks often run out. Nonetheless, due to its unmatched quality, professional-looking results and easy clean-up process, the Wagner 0515022T Reconditioned Pro Coat Airless Paint Sprayer is really one to beat. It is really worth every penny. When you are keen on choosing the best paint sprayer for latex, you can easily consume your time through researching, consultation, and comparison especially when you are looking at dropping a lot of cash. The fact that people are buying these and are accomplishing their goal – a professional finish – should give you some respite. With a few more findings such as reading more reviews on the actual product page before buying, you can make an informed decision because you will be more knowledgeable than the average searcher on how to select the best latex paint sprayer.